My response to being called a Jew Lover and called on the carpet for 'not getting' the Deception! Answer to the question on who Israel is and my own Strivings with God! Recently I got called out for being a "Jew lover" essentially. Of course we know about the skeletons in the closet, both metaphorically and well, Literal! I addressed some of this along with the Talmud and Kabbalah and some reports almost 2 years ago. I will put that research below. Initially I pointed at this research as the guy who called me out. ..I do believe to be a Patriot, as I have seen his posts and vice versa. We even discussed butter over margarine and had similar beliefs, so was caught somewhat by surprise when I get called out in a post By Name and accused. WHAT? I won't put his name to protect privacy of course, this is what he stated in a post for all, but specifically named Just me by his tagging (which annoyed me because I have yet to do the tagging correctly on that forum. . .I hate being such a newbie)! I grew up in Louisiana and Texas, soaked in the culture of fundie Southern Baptists. The primary means by which the Enemy wages war is via Deception. The Greatest Deception he has ever pulled was convincing good, honest people like @Melissa McGarity that this band of Christ-Hating Marxist Satanic Talmudists in the Middle East are the Israelites of the Old Testament. So I was Johnny on the spot to respond the First time because I was floored and have been attacked for this on other platforms. (Clearly he had hit his mark, we all have our "pride" after all). Yes, I get it. ..pride comes Before the Fall and Boy does it Ever! Most believers are not impervious to getting mocked and belittled if you don't join in the Jew hate. You are quickly marked and there are a host of posts dedicated to bringing me down on a certain other platform. Enough said on that. Clearly it's not wise to call out a powerful group of people, but I Have spoken plenty of times about the dichotomy of this group of people, yet Refuse to make a blanket statement. Likely why I am despised. That's okay. I just don't like someone sticking a knife in my back when they don't know me. The bar literally says "Acquaintances". We are in That category. We are after all told to Stand and be Ready to give an account. Doesn't matter if I'd rather discount it, when I'm required, I do so. So here was my First response as Yes, he put me on the defensive and I was appalled. (fine, I Allowed him to put me on the defensive and Took the bait Hook, Line and Sinker). I guess he knew me well enough to snuff that out! I’m not sure what this is about, but it is typical, I am called out by mockers and haters from the left and also people who I believe to be on the side of good even though I have done in depth research and reports on the Synagogue of Satan. I believe people Don’t know me or understand me, yet constantly belittle me. I’ve been called every name in the book and cussed out just for my own belief system. Never have I Once said there are not deceptive people calling themselves Jews. I have quoted the verse over and over while receiving hate where God calls certain people the Synagogue of satan. Why is this not enough? Because I don’t say it in the same manner or do research on other topics that are crucial and don’t just beat one drum? Because I call it the way I’m led by God? Or perhaps these are residual people from the posse on another board who are really part of shareblue posing to be on the side of Good to gather intel and Attempt to bring people like me down. David Brock and the infant lover have had a strong hate for me from the beginning. They don’t like me calling a spade a spade. I won’t have to in this case. … already revealed! There’s your Syn of Satan, who possibly thinks he’s chosen. Likely from the seed of the Rothschilds, which by the way I’ve broken down That family too who has the Syn of Satan lineage. Imposters, posers, likely lizard seed. Also trace many elites I do and their heritage back to Syn of satan. I’ve said over and over, some of these people had ancestors who said they were jews and were Not. Also many Rejected God right out and the Gentiles Are indeed part of the chosen IF they choose to trust Jesus to save them. I’ve done so to be censored by Zuck, Brin and his like. Affected my own business by pointing out the lineage of Bezos. . Jorgensen. He was adopted. I suspect it’s because people saying they are on on the side of Good Bully just as much as the people of the radical progressive on the left. So what I see at the end of the day is There is No Difference! Thanks for showing me and Great job Fooling me. Wouldn’t trust either side in a real battle because both groups would stick a blade in my back with their owned posse as soon as my head was turned. Now what have I said that is Wrong here? What are you trying to Prove? I haven’t seen any reports, articles or otherwise from many who are on this bandwagon, yet I’ve called out in reports, articles, research even King Solomon and his connections to the occult. You have NOT seen All the people I have gone toe to toe with showing research on issues like this. Long conversations trying to show them the truth when they want to debate, yet @Poster's Name (Dang, I still can’t do a tag right, well, there you go. … more for you to Mock for) and all of his friends are sure to show me what they Really think of me. . …while knowing NOTHING about me. I give Most of my free time trying to wake people up. But as it has Always been in my life. . .Not enough and being accused of something I don’t believe and work hard to dispel myths. Key Rules for Radicals tactic. Nice job! You got want you wanted. . .for me to know what you think of me even though you have likely read or seen Very little of my research and efforts. You don’t Know me At all! Well done, you got the rise out of me you wanted! No different than what the left does. You duped me for sure. And BONUS you get extra in your Shareblue paycheck for getting a response and it’s Long so. . .you’re welcome. But, must give credit where credit is due. I told the Shareblue trolls they better Pick up their game. They know precisely how to use satan’s no. #1 tactic. Use the work someone is doing against them. Bravo, tell Brock and Soros great job in listening. Perhaps I underestimated them after all. The mud book I broke down here, but few give a rip because MOST won’t wade through such a Quagmire! Did this report early on in waking up. . .but you don’t really care anyways. . .just hoping to get me to stop. Won’t work. Posting this so those who Don’t know will see I mean what I say! I hate lies and I despise False accusations! A year and a half ago I was calling this garbage out. I Despise it as much as God! What is the mystery religion, the Cabala where does it come from? Who helps perpetuate Pedogate? Following the rest of the reports and my articles related to the Rothschilds and their lineage. I will put all my data I gave him below in sources. Obviously, I figured this woud be the End of it. I had stated my case, given evidence of all I had done to address this bundle of confusion for everyone as it IS quite confusing. Through all my outrage and indignation at him. Attempted to put him in his place. I was able to take a break from that and focus on Haiti finally. Okay, it wasn't Really the end, because I'm a female and I mean no disrespect of my other Fine Patriots of my own gender, but I see how we have the memory of an elephant (plus that innate reaction of "you should think Twice before you cross me") and can give you factoid after factoid. . . .so That is what I did as I was of course still Quite outraged. So I engaged in some Offensive! I just let it rip! Don't worry, I pulled myself off and out for a time out after this one. YIKES! BTW, I haven’t darkened the door of a church for some time now Mr. Souther Baptist! When I woke up I saw what was going on in many Churches Regardless of denomination. Broke down the hierarchy and big wigs in the Catholic church several times. Character. …that’s what I’m always looking at. Not much to be had in this realm! To be expected! Oh, that wasn't the end of it at all. I'm a girl so I kept thinking and had something More to say. Likely he was just ignoring and Not reading by this point because I Also see how males operate. Not saying it's bad, you can only handle so much jibber jabber fact based or not before you just check out. I get it, but girls are generally On A Mission and we take that Seriously! We will persevere to the End! Now that I look it over, I am indeed pretty long winded. I tried to tag him in this one. . .FAIL, but did use his name. Figured out the proper way to tag in this forum for the current post, so that's a bonus. My mother would have figured it out the first time. She is a whiz at this multiple forum stuff so should have gotten her help. My parents went to churches some of them Baptists and I Always heard that God’s chosen from which the seed of His son would be born. …rejected their Messiah and the gospel message. I’ve seen Much wrong in churches and they have been infiltrated by luciferians put in place by Alice Bailey back when they called her Lucis Trust the Lucifer Trust. But the ones I had to attend Knew and Still Know full well who was Responsible for crucifying Christ. That being said. . .these churches. . .most, not all are weak as can be. They signed the 501c3 deal with the devil for 30 pieces of silver instead of trusting God to provide. Came along right after the first Bilderberg meeting. That should have been a Telling sign, but people are easily duped, bribed and enticed. At any rate. . .most of these churches don’t have leadership telling these people what is Really coming for them! Rapture isn’t even in the Bible. Not only are many of the jewish people infiltrated and duped, but so are many who Think they know all about God and what He wants. He wants a Light shown on All evil whether they call themselves, jews, christians, baptists, methodists, presbyterians, lutherans, non-denom (what a word denomination. …even as a kid I could see the Root). Doesn’t matter. Baby Rapers, child molesters, people defilers. . .Dark to Light! Did a story on this rabbi. HE is why I don’t blanket statement Any group. He IS jewish and was brave enough to call them out while getting acid in his face and threats. I posted this on a Voat board I started to try to expose these evil doers and get away from Pompous, arrogant people who think they Know all and do nothing but harm the cause of telling people truth by wasting their time trying to take down Hard Working, committed people to Truth! But Please carry on with Bashing me! I’m the enemy all right rather than These people doing these wicked deeds. While you’re at it, perhaps you have some words for this rabbi for exposing them! Finally I stopped. I had hurled lots of ammo and had far more, but realized even though tenacious, I had no more time to invest. I patted myself on the back of course reminding God of the valiant effort and how I had. ..
Steered clear of, shall we say certain photos many of us have seen from the WWII era and the engines that were really in some of those vehicles on Hitler's side. ..not to mention Where some of the money came from. Talk about selling out your own people (Soros). Anyhow, I felt vindicated. I had done my part right? Apparently Not! God had a lesson for me to learn as what He wrote through Paul is far clearer, more Blatant and Powerful. God has a great way of reminding us. . .no matter how much we Strive, He's got a Better Way! Doesn't make all we do entirely ineffective. . .He will just keep bringing it back around, until we Really get it. At that patting on the back for thinking I had navigated around the tricky parts was Completely Unfounded! At least that appears to be part of the lesson for me. Perhaps it is a different lesson for someone else. Here is how I found out I Wasn't Done. So after All that evidence, spending all free time not doing any Binge watching of X files or Lost, No more allowing the Box to Tell me their Vision, no more shopping (except for necessary supplies and if someone Needs something) because it's all going to burn anyhow, no more obsessive organizing. ..No gave it all up to Learn all that had been hidden in this fake realm and. .. here all that I had done to expose the dichotomy and lies were all for naught. It was time to sink into a downward spiral. Is this how some felt about the Law they were expected to uphold, but now appeared to be rendered almost useless? Bad comparison maybe, but I sure grasped how these people must have felt. You embrace it, you make it your way of life, part of you , get ripped to shreds for being so meticulous. ..in the end it can feel it was all for naught. A waste. So as I went on my marry way hunting down more pedo's, digging deeper into what the White Hats have been pointing at and trying to further the cause of the Great Awakening, lo and behold, I'm STILL being called out. My diatribe of outrage and dismay appeared to have done Nothing at all. Just like a bunch of useless rags regardless of the investment of time and energy. This is what I got back. Not an apology. . .oh no, a lesson. Apparently I had said this somewhere? I do write a lot, so quite likely. This Poster responds to my defense with. ..
God will continue to prosper the nation of Israel. Are you talking about the middle-eastern State run by Jews? Okay, so I tried to steer clear because it's messy and sometimes when you speak of these things. ..yes oddities can occur that let's you know "They're" watching. So I did what any blood fearing person would do. I did nothing. I told myself my prior response could stand on it's own. I have plenty to do like everyone else. . .perpetually behind trying to attend to work, family and the mounting web of corruptors that date back to ancient times. I continued dealing with other tentacles of the web while going about life. Managed to ignore the question and push forward. Sent it to my 5 days ago. I will turn that into forever. I mean I don't owe him an explanation, right God? I should have kept my mouth (thoughts) shut! 2 days ago. ..Same question by Poster as he Knows he's being ignored. Apparently you ask a question and He Will answer at some point. Not necessarily on our time, but His time! How I wish John were here today to do this! You know he would be far better at this than me God. He would likely have Far more patience too! This can't be ignored if I'm honest with myself and before God. So, I'm pretty stubborn at times, so it can take a while, but God lays it out Quite clearly! When I finally submit, God directs me to the passage and what we have all known and try to convey to people at times, but when I see them in His words, the words He gave to Paul. . .They are Far superior to my defense. All that time spent on showing the actions of people and the compromises, the diving into false teachings that were almost unbearably arduous. ..it was laid out plainly for those who truly wish to see. Then I Knew, I couldn't just ignore, I had to explain through God's Word. I really don't always appreciate how awe inspiring this is. I mean. . . God Breathed! God. ..Power, Spoke this World Into Existence. Have you seen the Nature, the genetic code? The renewal process. Yes, satan tries to destroy it. . .yet not all is destroyed. The Word is Alive and God has shown me it's power many times, I don't use it enough. Thank God He is patient with us. The Discerner! How I love to dis cern! So I stopped wrestling and striving. . .I finally said okay God. Let's do this Your way. So here was my response that I should have just dropped the other things vying for my attention and attended to the First Time. Of course I still justified as you will see in the opening. It's hard for me not to hang onto self and the attack against self. Okay @Charlie Prime, let’s do this! Too busy before And couldn’t believe someone would accuse me when they don’t know me from Adam. But hey, it is after all a free world and I do Believe in freedom. So here goes. Too many people are confused about what God meant About Israel. It NEVER was a place. Remember who God called Israel in the Bible. You said you were a Souther Baptist right? Well, you must have had that bible thumped at you a few times. I believe in the bible, I don’t always believe in the way people use it and Neither does God. In this passage people LOVE verse 3, but rarely go back to use their context cues and look at the passage as a Whole. Very dangerous when they don’t. He is talking to Abraham. Meaning the Sons Abraham will have. Name passed down through sons. But it has a deeper meaning. Here you see in Genesis 35:10 10 And God said unto him, Thy name is Jacob: thy name shall not be called any more Jacob, but Israel shall be thy name: and he called his name Israel. So God is Not speaking of a Nation State, but of Jacob in whose name Israel literally means to Strive with God or wrestle with God. Many people who know God strive with God and are persecuted when they uphold God’s ways over the ways of this Fake World. When Jesus was sent and died on that cross, God had made a way for all. The seed of Abraham is not only those born through his blood line. . .well, kind of, when you accept Jesus as your only way to God and what He offers there is Power in His Blood. We are now the sons and daughters if we accept God’s way of salvation, not by works as sadly not just some jews, but others are misled. For by grace are ye saved through faith! Those buying into the lies of the “religions leaders,” strive with satan and try to work out their salvation on their own. Many will and have jumped on board with transhumanism and seek everlasting life through their own works and that of technology. That is All the technology of the fallen and it was greater and more powerful long ago, but I digress. 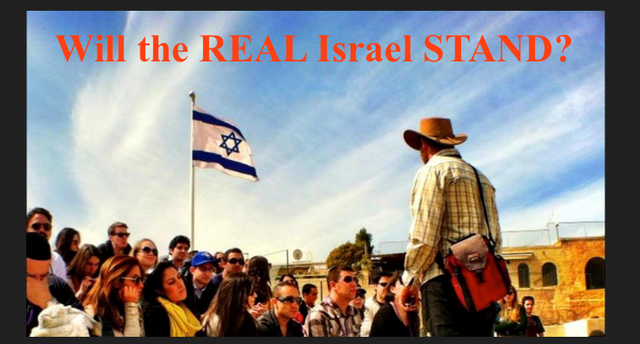 Those Even in the nation state of Israel, if they have Not put their trust in Jesus to save their soul, They are NOT the Israel God was speaking of. It is a Group of people who Strive for God. Not just the culture the Group that has become the sons and daughters of God by accepting His Plan, not their plan, not the religious leaders’ plan. …Only God’s Plan! There is only One Way to heaven. I generally refer to these people as the remnant. They can be of any ethnic background. Jesus is the Way the Truth and the Life. No man comes to the Father except by Him! Sadly many of the biological seed of Abraham have been led astray. They believed the lies of the Pharisees who were all about the law. That is the seed of rebellion and comes straight from their father, satan. 3 Are ye so foolish? having begun in the Spirit, are ye now made perfect by the flesh. By FAITH, not law which is based on works. If people have eyes to see and ears to hear, it is Not any Plainer than in these verses. I suggest reading the Entire passage, but this is relevant. Verses 23-25 it doesn’t Discount the law, but show how it is no longer effective after the New Covenant. Really I should just Shut Up! God explained it Far better than me! To answer your question. . .A group, that doesn’t mean we Know or may decide with blanket statements an Entire Nation state is corrupt. For example, we have corrupt leaders here in the US. . .Are we all corrupt? I have friends in Europe and the UK under their evil Laws, those leaders some of them pedos. …Does that make all who reside there corrupt and pedos? NO. I know some Good People scattered throughout who are Sons of God and they are all there as we are, living among the compromised and evil to Expose. If you put your trust and faith in God and Know Who you truly believe in for your salvation from this fake world and evil. . .You are Israel. Am I against those who are of a certain ethnic group, but think they are the chosen? How do we know. By their fruits. I see first hand who people like many of the corrupt steins and Shumer are in government. I know some have dual citizenship and talk out of both sides of their mouths. They have the tongue of a serpent like their father. . .forked! They are not the Israel God speaks of in the bible. I also see them in the entertainment industry. They are frauds, posers and the only way they will become the Chosen is if they turn from their evil and accept salvation through Jesus, God’s son! Doesn’t mean there are not and won’t be many more who Do come to understand the true path to salvation and being the True Chosen that are from the biological line of Jesus. There is hope for Jewish people to still accept our Messiah, in the same manner there is still hope for All Mankind if they repent and turn from their wickedness! That was the end of that and I suggest everyone read that Entire Passage in Galatians 3. Mind Blowing! Other Research which was put in the First detailed bellowing, outraged response. I Do love details. Truth IS in the details. Not all wish to, nor should they go down all rabbit holes at mach speed. You really need God's guidance in help or else you will be sleeping with one eye open all the time! Where did the Kabbalah come from? Who wrote the Cabala? What is the Kabbalah about? If you want to hear straight from the mouths of those who have opposing beliefs this video is one of the BEST I have seen to date which covers the Truth about what some jewish people belief. I repeat, this doesn't mean ALL. Tears apart the truth of those who are posing as Jews, and those who fit God's description. . .Syn of Satan! If I had a Pastor like this that actively went out and asked the hard questions. .. I'd darken the door of a "church" again!